That gauzy film that prevents you from seeing the horses in detail on postcards of Saratoga in the morning was the first sight that early risers had on Friday. On days like this, for some unexplained reason, the streets seem quieter than normal, as if the thick air is acting like a sponge. 7:00 am came and passed without the cars roaring down Fifth Avenue, the rap from their radios booming. The reverie didn’t last very long. If this was yesteryear, there’d be no racing to write about. 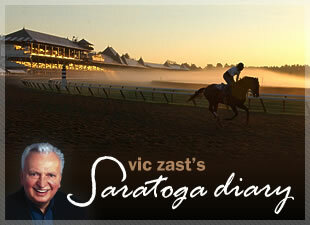 Saratoga’s completed the traditional 24 days of exclusive sport that was guaranteed 50 years ago. The next several weeks are a bonus. Canadian Frank Stronach, a free market stalwart, might consider the Harriman Law unconstitutional, but it’s a bill that raised the city out of certain disappearance. It was Fabulous Fillies Day, a day that by 20 or so hours presaged what will be an excellent Alabama Stakes. Except Friday’s “fabulous fillies” were women who gathered to wear pretty hats and learn about issues that mattered to them. Money was raised for Breast Cancer research. The color pink splattered everywhere. A pink flag flew in the infield. The saddle cloths were pink. Pink lipstick soiled many white collars. 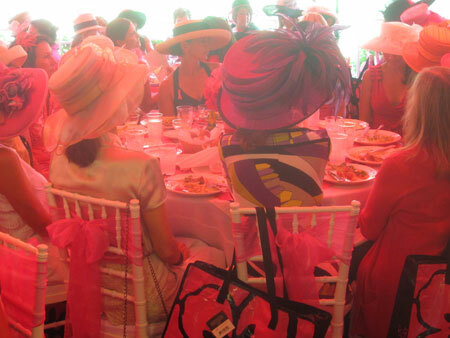 Here's to the ladies who lunch - at the Sizzling Hot Pink Hat Luncheon. In contrast to the sedate female behavior, Gregg “Free Beer” Daniels and Chris “Hot Wings” Michaels, two guys with a penchant for potty humor, broadcasted live from the Dunkin’ Donuts stand. Three hundred fans of the syndicated morning radio show descended upon the premises as early as 5:30 am. Three flirtatious “Q-tease” from station Q-103 FM, dressed in black and wearing piercings, hung around the periphery. The crowd roared when the band Sick Puppies was mentioned. Fans of the Free Beer and Hot Wings morning radio show find listening to the banter better than looking at Q-103 FM's Q-Tease. “Watch the teeth, man. Watch the teeth,” shouted onlooker Mitch Allen of Broadalbin, NY as a cast member named “Producer Joe” coaxed a horse to chew hay from his shirt as the morning’s last bit. “I listen to these guys every morning. I’ve never been to the track, so my wife and I called in,” explained the truant fan. “We’re headed to the casino as soon as this is over and back for the races later on,” Allen happily admitted. Horseplayers with more knowledge about horses than Producer Joe have been losing their shirts at the windows all summer. Those who bet on the favorites yesterday, on the other hand, made money. The average win payoff for the first eight of 10 races was just over $8.50. John Velazquez rode the winners of the opening four races, and then went cold as a mackerel. In the process, he brought hundreds of lemmings down hook, line and sinker.